In 1966, Kathleen Eaden, cookbook writer and wife of a supermarket magnate, published The Art of Baking, her guide to nurturing a family by creating the most exquisite pastries, biscuits and cakes. Now, five amateur bakers are competing to become the New Mrs. Eaden. There’s Jenny, facing an empty nest now that her family has flown; Claire, who has sacrificed her dreams for her daughter; Mike, trying to parent his two kids after his wife’s death; Vicki, who has dropped everything to be at home with her baby boy; and Karen, perfect Karen, who knows what it’s like to have nothing and is determined her facade shouldn’t slip. As unlikely alliances are forged and secrets rise to the surface, making the choicest pastry seems the least of the contestants’ problems. For they will learn–as Mrs. Eaden did before them–that while perfection is possible in the kitchen, it’s very much harder in life. SARAH VAUGHAN studied English at Oxford and went on to become a journalist. After eleven years working at theGuardian as a news reporter, health correspondent, and political correspondent, she started freelancing. She currently lives in Cambridge with her husband and two children. 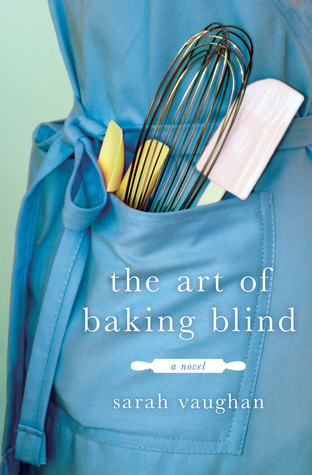 THE ART OF BAKING BLIND is her first novel. Thanks for visiting my pet post. I find myself talking to throw pillows once my visiting dogs leave. I see it out of the corner of my eye and think it’s a dog on the sofa! Hmm, interesting premise–the variety of contestants sounds interesting. Thanks for the chance to win. Hope you don’t mind – I put a link to your giveaway on my review of this book! How funny that we both had it on our blogs on the same day! Thank you for hosting this giveaway. I will add it to my blog’s sidebar later. I am relishing the cake and bake themes I am seeing in novels these days. Thanks for hosting this – it sounds like a great book!